I love my Eaters — All You Can Eat blog-readers. Yes: I’m talking about you — the food-savvy folks who do your best to make sure I don’t miss a trick, whether it’s a restaurant closure or changeover, a YouTube video I shouldn’t miss (I’m still dying of laughter over this one) or a don’t-miss-it Eater Feeder recommendation — like the one I just got from Wes Neuenschwander. ago. He’s promised me some special dishes. Will let you know how it goes. Wait a minute! — I wrote back. “Charlie” Chen? From Szechuan 99? You mean this guy? The waiter who always seems impressed when we order “the good stuff”? The one I gave a shout-out to right here on the blog when I wrote about favorite waiters? Funnily enough, Mac, Nate and I had an incredible meal at Szechuan 99 a few weeks back — among the best we’d ever eaten there (and we eat there a lot). That said, service was slow, as only one woman worked the room, the phone kept ringing off the hook for take-out and we were lamenting the the fact that Charlie — who could single-handledly run the place with a smile on is face (see above) — was nowhere in sight. 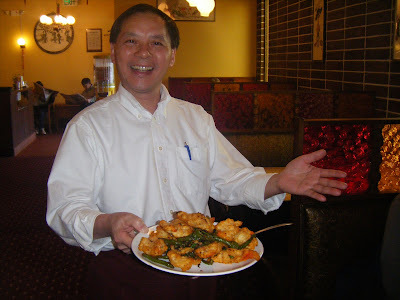 While the menu is, in some respects, less adventuresome than either Szechuan Beanflower or Szechuan 99 (reflecting the rather obvious demographics of his little South Everett Hwy 99 strip mall location), he’s definitely put his own stamp on the lineup (and expects to add more). best dumplings we’ve ever had (even better than Fu Man Dumpling House). Kung Pao Chicken: Charlie surprised us with this one, as I usually avoid KPC like steam table egg rolls. Simply stunning. And now a theme emerges: not only the best and freshest ingredients, but ingredients prepared in way that each flavor jumps out from the intensely flavorful background. And another theme: WOW! Fried Egg and Tomato Noodle Soup: I was first introduced to this Sichuanese homestyle classic back in the Beanflower days when I took a Hunan born and raised co-worker to lunch. She and Charlie composed a 90-minute lunch extravaganza that alternated fiery hot appetizers and main course with cool and sublime. Rich and silky, I’m so glad this one made the trip north with Charlie. OK, Wes. You had me at “Charlie Chen.” I’ve waited too long to be Wowed. See you (and Charlie!) there, and soon.